Harvard Hiring Short Sellers, Not Good. If you're invested in the markets either through a 401K, stock portfoilo, or retirement account based on the S&P500, you better buckle u and I don't mean buckle up with the standard seat belt found in everyday cars, I'm talking about the 5-point harness used by professional race car drives. If you thought the last month and a half was turbulent, as the saying goes "You haven't seen anything yet". Today CNN released an article about the $38 BILLION DOLLAR Harvard Endowment looking to hire Short Selling Professional Fund Managers because they believe the market is "frothy". Their financial head also stated that current market conditions "present various challenges to investors." "This environment is likely to result in lower future returns than in the recent past," wrote Stephen Blyth, who took over as Harvard's chief investment officer in January. In his note, Blyth said he's looking for managers with expertise in short selling to cope with a market that's "potentially frothy." He's also worried about liquidity, pointing to the dramatic drop in U.S. Treasuries on October 15, 2014 as "a stark manifestation of the evaporation of liquidity." He said that liquidity can vanish from the market even "when no material economic event has occurred." In finance, short selling (also known as shorting or going short) is the practice of selling securities or other financial instruments that are not currently owned, and subsequently repurchasing them ("covering"). What does Shorting do to the markets? Well when you short, you are basically borrowing the stock and immediately selling it. Now shorting can be a bit confusing but your main take away is this, it creates a massive sell on the markets. Anytime massive selling begins on the markets, the markets themselves, the computer generated algo's, and the world begins to panic. This creates a serious amount of downward pressure on the market which can very quickly result in a panic which can lead to a crash. Now I'm not a doom and gloom guy at all, I'm a complete positive based optimist but at the same time, a realist as well. If you ignore facts, well, then you ignore facts. The facts Im speaking to are the evidence which leads to an event, also known as pattern matching. Pattern matching helps predict what's about to happen before it actually happens. This is how the Hedge Funds rake in the big gains. During the boom times, ie. the last few years, 80% of Hedge Funds don't do very well because they're primarily betting on the downside. When the downside does take place again they'll rake in huge profits. Which is precisely the pattern setting up right now. Everyday there are numerous factors causing changes within the markets. We work to isolate and identify these instances and make sure our subscribers are prepared in advance of the coming changes. After all, no one likes to be caught off guard. 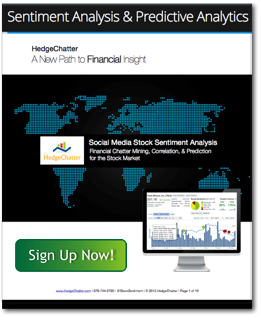 The HedgeChatter service provides you with the know how and intel of what's about to come in the markets. Our track record speaks volumes as we've been accurate within11 days, 22 times this year. That's a 100% accuracy rate. To find out more simply click the link on the right.